Conferences supported by the Center for Intercultural Studies until 2014. Aleksey Tashinskiy (Russian) Conference "The Germersheim Encyclopedia (Portraits of Literary Translators) - Micro- and Macrostructure"
November 14-16, 2014 KELLETAT, ANDREAS / TASHINSKIY, ALEKSEY / BOGUNA, JULIJA (Eds.) (2016): Übersetzerforschung. Neue Beiträge zur Literatur- und Kulturgeschichte des Übersetzens. Berlin: Frank & Timme. 356 p.
Dr. Martina Kopf (Comparative Literature) Conference "Comparative Perspectives on Europe and Latin America"
Prof. Dr. Veronique Porra (Romance Studies) Lecture Series "Orient: Construction and Deconstruction of a Phantasm"
Prof. Dr. Alfred Hornung (American Studies) International Conference "Obama and Transnational American Studies"
Prof. Dr. phil. Renata Makarska (Polish) Conference "Comic in Poland. 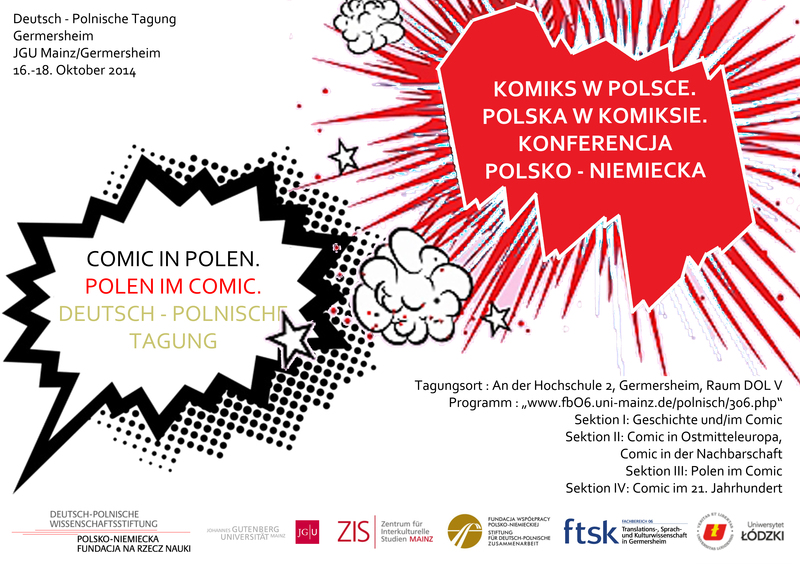 Poland in Comic"
Prof. Dr. Jutta Ernst (American Studies) Conference "Shifting Grounds: Cultural Tectonics along the Pacific Rim"
ZIS Conference "Academic Mobility - Challenges of Internationalization"
May 16, 2014 SPICKERMANN, HEIKE C. (Ed.) (2015): Weltliteratur interkulturell. Referenzen von Cusanus bis Bob Dylan. Für Dieter Lamping zum 60. Geburtstag. Heidelberg, 170 p.
Prof. Dr. Elisabeth Oy-Marra (Art History) Conference "Translation as cultural practice in artistry"
Dr. Caroline Mannweiler (Comparative Literature) Symposium "Jacques le fataliste and the European Novel"
Prof. Dr. Michael Schreiber (Romance Studies) Conference "Migration - Crisis - Research"
November 15-16, 2013 HELLER, LAVINIA (Ed.) (2017): Kultur und Übersetzung. Studien zu einem begrifflichen Verhältnis. Bielefeld, 302 p.
apl. Prof. Dr. Josef Rauscher (Philosophy) Conference "Classical Hollywood and continental Philosophy"
November 15-16, 2013 RITZER, IVO (Ed.) (2015): Classical Hollywood und kontinentale Philosophie. Wiesbaden, 229 p.
Poster MÜLLER, KLAUS PETER (Ed.) (2015): Scotland 2014 and Beyond – Coming of Age and Loss of Innocence. Frankfurt a.M. (u.a. ), 457 p.
ao. Prof. Mag. Dr. Friedrich Frosch (University of Vienna) Conference "Transpositions: Brazilian Literary Film Adaption"
Prof. Dr. Matthias Krings (Ethnology) GAA Conference 2013 "Locations: anthropology in the academy, the workplace, and the public sphere"
Prof. Dr. Nicole Priesching (Universtity of Paderborn) Conference "Ransom of Prisoners in the Mediterranean. An Interreligious Comparison"
September 19-21, 2013 GRIESER, HEIKE/ NICOLE PRIESCHING (Eds.) (2015): Gefangenenloskauf im Mittelmeerraum: ein interreligiöser Vergleich. Akten der Tagung vom 19. Bis 21. September 2013 an der Universität Paderborn. Hildesheim, 356 p.
Prof. Dr. Anton Escher (Geography) Workshop "GIS of Byzantium"
June 7-9, 2013 KELLETAT, ANDREAS F./ ALEKSEY TASHINSKIY (Eds.) (2014): Übersetzer als Entdecker. Ihr Leben und Werk als Gegenstand translationswissenschaftlicher und literaturgeschichtlicher Forschung. Berlin, 376 p.
Dr. Thomas Klein (Media Studies) Conference "Interculturality, Transmediality, and Hybridity of the Western Genre"
Prof. Dr. Dieter Lamping (Comparative Literature) Conference "The Europe of Literatures"
Prof. Dr. Silvia Hansen-Schirra (Romance Studies) Lecture Series "Translation and Interculturality"
PD Dr. Marcus Stiglegger (Media Studies, University of Siegen) Conference "Borderland. Frontiertheory and Vigilantism"
ZIS Working Group on Interculturality 2. Symposium "Strategies and Forms of Appropriating the Other"
Prof. Dr. Carla Schelle (Working Group on Research in Primary Education, Primary Education Pedagogy) Conference "Schools and Teaching in France, Francophone Northwest Africa and Germany"
July 5-7, 2012 SCHELLE, CARLA (Ed.) (2013): Schulsysteme, Unterricht und Bildung im mehrsprachigen frankophonen Westen und Norden Afrikas. Münster, 282 p.
Dr. Petra Guasti (Political Science) Workshop "The Violation of Human Rights in New Europe: A Cross-National Analysis"
Prof. Dr. Bernd Meyer (Intercultural Communication) Conference "In-Between, but not Inside: Cultural Brokers in German-Chinese Contacts"
Prof. Dr. Christiane Tietz (Systematic Theology and Social Ethics) Conference "Translating Religion - Gains and Loss in the Translation of Religions"
Dr. Roman Mauer (Film Studies) International Dialogues series "Shot/Countershot: Film Auteurs in Intercultural Dialogue." Directors Ulrich Seidl and Andres Veiel in Conversation: "Fiction/Non-Fiction:Social Psychograms and Hybrid Aesthetics." Jaspal Singh (University of Cardiff) Workshop "Living in Poverty in Urban India: Perspectives, Challenges, Consequences"
Dr. Hauke Dorsch (Ethnology) Syposium "African Music in the 21st Century - An Iconic Turn?" ZIS / Center for Intercultural Studies, JGU Mainz Annual Congress of the German Association of American Studies on the topic "American Lives"
CinéMayence Symposium "Re-Ethnicization, Reappropriation of Tradition and Staging of Indigeneity"
May 18-20, 2012 BANERJEE, MITA/ BLÄTTER, ANDREA/ ESCHER, ANTON (Eds.) (2015): Re-Ethnisierung, Repräsentation von Indigenität und gelebte Bikulturalität. Heidelberg, 162 p.
Prof. Dr. Michael Schreiber (Romance Studies) Lecture Series "Court Interpreting"
Jun.-Prof. Dr. Kylie Crane (English and Liguistics) Lecture Series "Understanding India"
Institute for Migration Studies (IMS) Lebanese American University "Relationships between Diasporas and Their "Homeland" and Their Impact on the State, National Identities, and Peace & Conflict"
February 2-4, 2012 BATROUNEY, TREVOR/ TOBIAS BOOS/ ANTON ESCHER/ PAUL TABAR (Eds.) (2014): Palestinian, Lebanese and Syrian Communities in the World. Theoretical Frameworks and Empirical Studies. Heidelberg, 218 p.
Prof. Dr. Norbert Grob (Film Studies) "Intercultural Influences in Classical Hollywood"
Dr. Natalia Shchyhlevska (Dept. of German Studies, JGU Mainz) Workshop "Language of Intercultural Literature"
December 2/3, 2011 SHCHYHLEVSKA, NATALIA/ CARMINE CHIELLINO (Eds.) (2014): Bewegte Sprache. Vom „Gastarbeiterdeutscher“ zum interkulturellen Schreiben. Dresden, 288 p.
November 18/19, 2011 DIZDAR, DILEK/ ANDREAS GIPPER/ MICHAEL SCHREIBER (Eds.) (2015): Nationenbildung und Übersetzung. Berlin, 172 p.
Prof. Dr. Birgit Menzel (Russian Studies, Faculty of Translation Studies, Linguistics, and Cultural Studies, JGU Mainz Germersheim) Conference "Returning to Foreign Lands? The Ethnic Remigration of Russian-German Spätaussiedler"
November 10-12, 2011 MENZEL, BIRGIT/ CHRISTINE ENGEL (Eds.) (2014): Rückkehr in die Fremde?. Ethnische Remigration russlanddeutscher Spätaussiedler. Berlin (Ost-West-Express. Kultur und Übersetzung), 298 p.
Prof. Dr. Michael Kißener (Dept. of History, JGU Mainz) Summer Academy "The Civil Society in the Process of State Harmonization and Reconciliation: A Comparison of France/Germany and Greece/Turkey"
Part 3: "The Significance of Borders and of Border-Crossing Relationships"
Prof. Dr. Asta Vonderau (Dept. of German Studies, Cultural Anthropology Division, JGU Mainz) Interdisciplinary Conference "Games Without Frontiers? Europe in Artistic and Cultural Practice"
July 15-17, 2011 BACHMANN, MICHAEL/ ASTA VONDERAU (Eds.) (2015): Europa – Spiel ohne Grenzen?. Zur künstlerischen und kulturellen Praxis eines politischen Projekts. Bielefeld, 270 p.
ZIS Working Group on Interculturality Symposium "Forms and Strategies of Appropriating the Other"
Prof. Dr. Oksana Bulgakowa (Film Studies, JGU Mainz) Symposium "Electrified Voices: Times Images and Identity Images in Cultural Comparison"
June 15/16, 2011 BULGAKOWA, OKSANA (Ed.) (2012): Resonanz-Räume. Die Stimme und die Medien. Berlin (= Medien/Kultur, 6), 292 p.
Prof. Dr. Bernhard Reitz (Div. of British Studies, JGU Mainz) International Conference "Ethical Debates in Contemporary Theatre and Drama"
June 2-5, 2011 BERNINGER, MARK/ BERNHARD REITZ (Eds.) (2012): Ethical Debates in Contemporary Theatre and Drama. Contemporary Drama in English, 19. Trier: Wissenschaftlicher Verlag Trier. Prof. Dr. Horst W. Drescher (British Studies, FTSK, JGU Mainz Germersheim) Conference "SCOTLAND – ScottLAND"
May 26-29, 2011 MÜLLER, KLAUS PETER/ BERNHARD REITZ/ SIGRID RIEUWERTS (Eds.) (2013): Scotland’s Cultural Identity and Standing. Trier, 234 p.
PD Dr. Sascha Seiler (General and Comparative Literary Studies, JGU Mainz) Conference "Bob Dylan and the revolution of the popular music"
Prof. Dr. Paul Tabar (Institute for Migration Studies, Lebanese American University, Beirut) International Conference "Palestinian, Syrian and Lebanese Communities in the World: Theoretical Frameworks and Empirical Studies"
May 19-22, 2011 BATROUNEY, TREVOR/ TOBIAS BOOS/ ANTON ESCHER/ PAUL TABAR (Eds.) (2014): Palestinian, Lebanese and Syrian Communities in the World. Theoretical Frameworks and Empirical Studies. Heidelberg, 218 p.
Prof. Dr. Alfred Hornung (American Studies, JGU Mainz) Workshop in Critical Humanities "Mapping the World, Mapping Literature: A Global Community of Letters?" Prof. Dr. Silvia Hansen-Schirra (FTSK, JGU Mainz Germersheim) Lecture Series "Translation and Ideology"
Katharina Alt, M.A. (ZIS, JGU Mainz) Presentations "Migration Studies"
PD Dr. Marcus Stiglegger (Media Studies, University of Siegen) Workshop "Mimography in Contemporary East Asian Cinema"
Symposium "Intercultural Bodies - Medial Representations of Bodies in Intercultural Comparison"
November 25-27, 2010 RITZER, IVO/ MARCUS STIGLEGGER (Eds.) (2012): Global Bodies. Mediale Repräsentationen des Körpers. Berlin, 336 p.
Dipl.-Transl. Michael Pörner (Div. of Chinese, Faculty of Translation Studies, Linguistics, and Cultural Studies, JGU Mainz Germersheim) Lecture series "China, China, China"
Prof. Dr. Jan Kusber (Dept. of History, Div. of East European History, JGU Mainz) Conference "Germany, France, Poland from 1945 to Present: Exchange and Cooperation"
October 7-9, 2010 DEFRANCE, CORINE/ MICHAEL KIßENER/ JAN KUSBER (Eds.) (2015): Deutschland – Frankreich – Polen seit 1945. Transfer und Kooperation. Brüssel, 291 p.
Prof. Dr. Hajo Zeeb (University Medical Centre, JGU Mainz / BIPS University of Bremen) Interdisciplinary Conferende "Health, Culture and the Human Body: Epidemiology, Ethics and the History of Medicine: Perspectives from Central Europe and Turkey"
Prof. Dr. Tobias Nicklas (University of Regensburg) International Conference "Themes in Biblical Narrative: The Day of Atonement"
Prof. Dr. Alfred Hornung (Dividion of American Studies, JGU Mainz) International Conference "Ecology and Life Writing"
June 24-27, 2010 HORNUNG, ALFRED/ THAO BAISHENG (Eds.) (2013): Ecology and Life Writing. Heidelberg, 413 p.
Prof. Dr. Fabienne Liptay (Art History, LMU Munich) International Symposium "Crossing Borders: Transcultural Perspectives in Films of Female Film Producers"
Alfred Wittstock (Israel Study Unit, Institute of Political Science, JGU Mainz) Symposium "The World Facing Israel, Israel Facing the World"
May 25-27, 2010 WITTSTOCK, ALFRED (Ed.) (2011): The World facing Israel – Israel facing the World. Berlin, 280 p.
Prof. Dr. Thomas Bierschenk (Dept. of Anthropology and African Studies, JGU Mainz) International Conference "Continuities and Dislocations: 50 Years of African Independence"
April 7-11, 2010 BIERSCHENK, THOMAS/ EVA SPIES (Eds.) (2012): 50 Jahre Unabhängigkeit in Afrika, Kontinuitäten, Brüche, Perspektiven. Mainzer Beiträge zur Afrikaforschung, Band 29. Köln, 572 p.
Prof. Dr. Klaus Peter Müller (English) International Conference "British Film 2000-2010: Crossing Borders, Transferring Cultures"
Dr. Melina Germes (University of Erlangen) Conference "New Cultural Geography VII 'Mind the Map' About Breaks and Differences"
Dr. Ivo Ritzer (Film Studies) Symposium "Western Films – Intercultural Perspectives"
November 20/21, 2009 KLEIN, THOMAS/ IVO RITZER/ PETER W. SCHULZE (Eds.) (2012): Crossing Frontiers. Intercultural Perspectives on the Western. Marburg, 197 p.
Prof. Dr. Peter Kupfer (Chinese Philology) Lecture Series "Fascination Silk Route"
Prof. Dr. Alfred Hornung (American Studies) Founding Conference IABA Europe "Life Writing in Europe"
VU University Amsterdam, October 29-31, 2009 HUISMAN, MARIJKE/ ANNEKE RIBBERINK/ MONICA SOETING/ ALFRED HORNUNG (Eds.) (2012): Life Writing Matters in Europe. Heidelberg, 326 p.
Prof. Dr. Oliver Scheiding (American Studies) "German-Speaking People in the Greater Mid-Atlantic Region: Cross Cultural Contacts and Conflicts 1700-1800"
Prof. Dr. Alois Wierlacher (Intercultural German Philology) Symposium "Progressing a cultural and intercultural Research on Hospitatility"
Dr. Bojko Bucar (Ljubljana) Conference "Transnational Contacts: Formations of Interaction in Border Areas", 1970-2007. Prof. Dr. Irene Dingel (Institut for European History, JGU Mainz) Conference "The Political Task of Religion: Perspectives from Three Monotheistic Religions"
Jun.-Prof. Dr. Annette Imhausen (History of Mathematics) Conference "Writings of Early Scholars in the Ancient Near East, Egypt and Greece: About the Facility to Translate Science Languages of the Ancient Times"
Prof. Dr. Holger Preuss (Sport Sciences, Economics and Sociology) Symposium "Internationalism in the Olympic Movement"
May 22, 2009 PREUß, HOLGER/ KARSTEN LIESE (Eds.) (2011). Internationalism in the Olympic Movement. Idea and Reality between Nations, Cultures, and People. Wiesbaden, 157 p.
Prof. Dr. Onookome Okome (Film Studies, University of Alberta, Canada) International Symposium "Nollywood and Beyond: Transnational Dimensions of an African Video Industry"
May 13-16, 2009 KRINGS, MATTHIAS/ ONOOKOME OKOME (Ed.) (2013): Global Nollywood. The transnational Dimensions of an African Video Film Industry. Bloomington, 371 p.
Dr. Şebnem Bahadır (Translation Sciences) Conference "Translation as a Key Term of Interdisciplinarity"
Dr. Oliver Immel (Philosophy) "The Internate and the Foreign"
September 1-3, 2008 BARTMANN, SYLKE/ OLIVER IMMEL (Eds.) (2012): Das Vertraute und das Fremde. Differenzerfahrung und Fremdverstehen im Interkulturalitätsdiskurs. Bielefeld, 268 p.
Dr. Eberhard Guhe (Indology) "Live - Body - Person. Intercultural aspects of a problematic Proportion"
PD Dr. Sascha Seiler (Comparative Literture) Symposium "9/11 as a Cultural Cesura"
February 14-15, 2008 POPPE, SANDRA / THORSTEN SCHÜLLER/ SASCHA SEILER (Eds.) (2009): 9/11 als kulturelle Zäsur. Repräsentationen des 11. September 2001 in kulturellen Diskursen, Literatur und visuellen Medien. Bielefeld, 341 p.
Dr. habil. Susanne Marschall (Film Studies) "Indian Cinema Cultures"
January 11-13, 2008 MARSCHALL, SUSANNE/ RADA BIEBERSTEIN (Eds.) (2014): Indiens Kino-Kulturen. Geschichte, Dramaturgie, Ästhetik. Marburg, 356 p.
Student Association "Migration and Development" Migration & Development "Migration neu denken!" October 4-7, 2007 KUPFER, PETER (Ed.) (2010): Wine in Chinese Culture. Historical, Literary, Social and Global Perspectives. Münster (= Wissenschaftsforum Kulinaristik, 2), 303 p.
"Civil Society and Franco-German Approach Since 1945"
September 20/21, 2007 DEFRANCE, CORINE/ MICHAEL KISSENER/ PIA NORDBLOM (Eds.) (2010): Wege der Verständigung zwischen Deutschen und Franzosen nach 1945. Zivilgesellschaftliche Annäherungen. Tübingen, 412 p. (= edition lendenmains 7). "Native American Studies Across Time and Space: International Symposium on the Indigenous Americas"
July 12-14, 2007 SCHEIDING, OLIVER (Ed.) (2010): Natives American Studies across Time and Space. Essays on the Indigenous Americans. Heidelberg, 221 p.
Dr. Gerd Becker (Ethnology) Filmfestival "I CAN SEE - Tage des geographisch-interkulturellen Films"
Conference "Comics as a Nexus of Culture"
"(Edition) A terceira margem: Vilém Flusser and Brasil. Context - Migration - Translations"
Das Dritte Ufer. Vilém Flusser und Brasilien. Kontexte - Migration - Übersetzungen. The Look from the Outside: The Perception of the Augustus in the Provinces and the Neighbouring States of the Empire Romanum"
October 12-14, 2006 KREIKENBOM, DETLEV/ KARL-UWE MAHLER/ PATRICK SCHOLLMEYER/ THOMAS M. WEBER (Eds.) (2008): Augustus- Der Blick von außen. Die Wahrnehmung des Kaisers in den Provinzen des Reiches und in den Nachbarstaaten. Akten der internationalen Tagung an der Johannes Gutenberg- Universität Mainz vom 12. bis 14. Oktober 2006 (= Königtum, Staat und Gesellschaft früher Hochkulturen, Bd. 8). Wiesbaden, 363 p.
Conference "Dialogue in and between different cultures"
September 25-28, 2006 GREIN, MARION/ EDDA WEIGAND (Eds.) (2007): Dialoque and Culture. Münster (= Dialoque Studies, Bd 1). Amsterdam, 262 p.
International Conference "Autobiography and Mediation"
Juli 27-31, 2006 HORNUNG, ALFRED (Ed.) (2010): Auto/Biography and Mediation. Heidelberg, 569 p.
Migration and its Social Results"
Conference "Schopenhauer and India - an Example of Intercultural Influences"
June 26/27, 2006 3 published lectures at: Schopenhauer-Jahrbuch, Band 88. Eds. by KOßLER, MATTHIAS und DIETER BIRNBACHER. Würzburg 2007.
International Symposium "Departure in New Dimensions. The Italian Film of the Sixties"
March 6-8, 2006 KOEBNER, THOMAS/ IRMBERT SCHENK (Eds.) (2008): Das goldene Zeitalter des italienischen Films. Die 1960er Jahre. Munich, 504 p.
Prof. Dr. Susanne Klengel (Romance Languages and Literatures) Culture, Translation "Publication of an Lecture Series 2004/2005" GIPPER, ANDREAS/ SUSANNE KLENGEL (Eds.) (2008): Kultur, Übersetzung, Lebenswelten. Beiträge zu aktuellen Paradigmen der Kulturwissenschaften. Würzburg, 333 p.
Interdisciplinary Conference "The Discursive Constitution of the 'Frankophonie'"
"Between Visual Cultural Studies and Picture Theory"
September 23/24, 2005 BERNINGER, MERK/ JOCHEN ECKE/ GIDEON HABERKORN (Eds.) (2010): Comics as aNexus of Cultures. Essays on the Interplay of Media, Disciplines and International Perspectives. Jefferson, 308 p.
International Conference "Hànzì rènzhi– How Western Learners Discover the World of Written Chinese"
Tagung "Schopenhauer and the Philosophy of Asia"
July 7/8, 2005 KOßLER, MATTHIAS (Ed.) (2008): Schopenhauer und die Philosophien Asiens. Beiträge zur Indologie. Wiesbaden, 128 p.
Conference "Gravity Regulated: Spatializing and Localizing Selves in Cultures"
Prof. Dr. Klaus Peter Müller (English/ FASK Germersheim) Conference "Scotland´s Cultural Standing and Identity"
February 25-27, 2005 MÜLLER, KLAUS PETER/ BERNHARD REITZ/ SIGRID RIEUWERTS (Eds.) (2013): Scotland’s Cultural Identity and Standing. Trier, 234 p.
Conference "Kulturelle Strategien zur Bewältigung von Umbrucherfahrungen in den muslimischen Regionen der (ehemaligen) Sowjetunion"
Symposium "The Black Orpheus as intercultural Metapher"
Symposium "The Geography of Cinema - a Cinematic World"
June 24-26, 2004 ZIMMERMANN, STEFAN/ CHRIS LUKINBEAL/ ANTON ESCHER (Eds.) (2008): The Geography of Cinema- A Cinematic World. Stuttgart, 204 p.
Conference "Russian Emigration from 1917 untill today: Literature - Language - Culture"
Lecture Series "African Ora-/ Litera-Tours"
Prof. Dr. Frank Zipfel (Comparative Literature) Kolloquium "Écritures migrantes/ Migrant Writing/ Schreiben und Migration"
June 26-28, 2003 DUMONTET, DANIELLE/ FRANK ZIPFEL (Eds.) (2008): Ecriture migrante / Migrant Writing. Schreiben und Migration. Hildesheim, 217 p.
Prof. Dr. Peter Claus Hartmann (History) Colloquium "Religion and Culture in 17th and 18th Century Europe"
HARTMANN, PETER C. (Ed.) (2004): Religion und Kultur im Europa des 17. und 18. Jahrhunderts. Mainzer Studien zur Neueren Geschichte Bd. 12. Frankfurt a. M., 536 p.
Dr. theol. habil. Jörg Lauster (Protestant Theology) Conference "Symbol, Existenz, Lebenswelt. Kulturphilosophische Zugänge zum Problem interkulturellen Denkens"
IMMEL, OLIVER/ HANS-MARTIN GERLACH/ ANDREAS HÜTIG (Eds.) (2004): Symbol, Existenz, Lebenswelt. Kulturphilosophische Zugänge zur Interkulturalität. Frankfurt a.M., 191 p.
Prof. Dr. Dieter Lamping (Comparative Literature) "Jewish Women`s Writing of the 1990s and Beyond in Great Britain and the United States"
January 31 - February 2, 2003 BEHLAU, ULRIKE/ BERNHARD REITZ (Eds.) (2004): Jewish Women's Writing of the 1990s and Beyond in Great Britain and the United States. Trier, 337 p.
December 12-15, 2002 HERGET, WINFRIED/ ALFRED HORNUNG/ KLAUS LUBBERS (Eds.) (2004): „Intercultural America“. Heidelberg, 362 p.
International Conference "Youth in Germany and Poland under the Microscope"
West-östliche Medienperspektiven 2. Symposium "Mythos Ägypten"
October 24/25, 2002 ESCHER, ANTON/ THOMAS KOEBNER (Eds.) (2005): Mythos Ägypten. West-Östliche Medienperspektiven II. Remscheid, 201 p.
Generation Relations and Constitution of Self under Aspects of Migration"
September 26-28, 2002 BADAWIA,TAREK/ FRANZ HAMBURGER/ MERLE HUMMRICH (Eds.) (2003): Wider die Ethnisierung einer Generation. Beiträge zur qualitativen Migrationsforschung. Frankfurt/London, 353 p.
First World Congress for Middle Eastern Studies "WOCMES"
"Interculturality - Actual Tendencies in Literatur, Speech and Society"
Dr. Heike Roggenthin (Geography) Lecture Series "The Near East: Cultural Dynamics and Social Transformation"
"Jewish Theater in German-Speaking Areas"
Symposium "Social Work and Racism"
Dr. Helmut Schmahl (History) Conference of the Interdisciplinary Research Group North American Studies: "Between two Worlds: Emigration, Settlement, Acculturation"
May 25/26, 2001 RÖDEL, WALTER G./ HELMUT SCHMAHL (Eds.) (2002): Menschen zwischen zwei Welten: Auswanderung, Ansiedlung, Akkulturation. Trier, 197 p.
Prof. Dr. Dieter Lamping (Comparative Literature) Symposium of the Interdisciplinary Research Group Jewish Studies "Identity and Memory in Jewish Literature after 1945"
November 15-17, 2000 LAMPING, DIETER (Ed.) (2003): Identität und Gedächtnis in der jüdischen Literatur nach 1945. Berlin, 229 p.
Prof. Dr. W. Zwickel (Old Testament and Biblical Archaeology) International Symposium "Cinema and the Middle East"
Workshop "Economic Activities of Migrants from the Middle East"
October 12-14, 2000 MEYER, GÜNTER ET AL. (Ed) (2001): Cinema in the Middle East. Vorträge des DAVO-Kongresses 2000 in Mainz. In: DAVO-Nachrichten Heft 13(2001). p. 8-11. "Transitional Identities - Identités Transitoires"
Interdisciplinary Research Group "Third World" Symposium "Ethnic Conflicts in the Third World - Causes and Consequences"
November 4/5, 1999 ESCHER, ANTON (Ed.) (2000): Ausländer in Deutschland. Probleme einer transkulturellen Gesellschaft aus geographischer Sicht. Mainzer Kontaktstudium Geographie, Bd. 6. Mainz, 128 p.
May 21-24, 1998 REITZ, BERNHARD (Ed.) (1999): Race and Religion in Contemporary Theatre and Drama in English. Trier, 212 p.
"Jewish Doctors in Germany, 1933-1945"
May 15/16, 1998 BAREUTHER, HERBERT ET AL. (Ed.) (1998): Vom "unnütz verlogen Volk" zum "volksfremden Denken". Polemik gegen jüdische Ärzte im Wandel der Geschichte. In: Medizin und Antisemitismus. Historische Aspekte des Antisemitismus in der Ärzteschaft. Sigmund Freud-Institut. Materialien 17. Münster/W. p. 31-47. PD Dr. D. Neubert (Ethnology) "Political Participation in Democracies: An Intercultural Comparison of Formal and Informal Institutions"
April 24/25, 1998 LAUTH, HANS-JOACHIM/ ULRIKE LIEBERTH (Eds.) (1999): Im Schatten demokratischer Legitimität. Informelle Institutionen und politische Partizipation im internationalen Demokratievergleich. Wiesbaden, 301 p.